Appointment of Pay Revision Commission for the State Government Employees Orders Issued. 1.The Pay Scales of State Government employees were revised With effect from 1.7.2013, with monetary benefit from 2.6.2014. As per convention, the Pay Scales of the Employees are due for revision with effect from 1.7.2018. 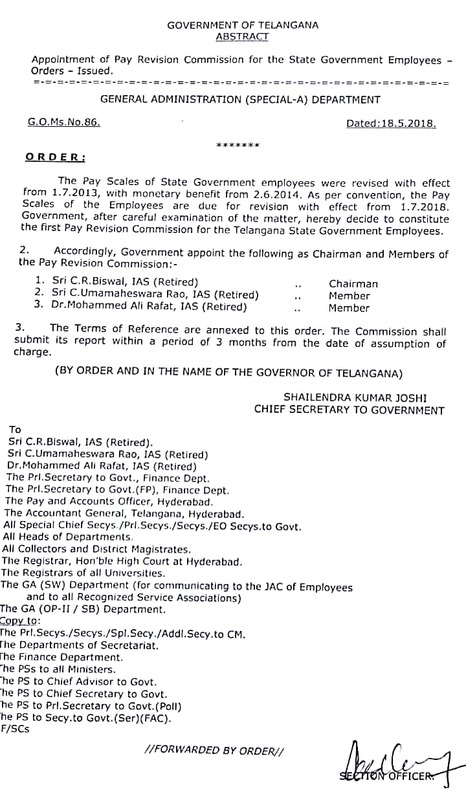 Government, after careful examination of the matter, hereby decide to constitute the first Pay Revision Commission for the Telangana State Government Employees. 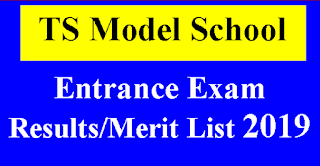 submit its report Within a period of 3 months from the date of assumption of charge. The Commission however shall, not deal with the teaching staff in Government Colleges and Government Aided private Colleges drawing UGC/AICTE and ICAR scales. The Commission shall not deal with the officers of State Higher judicial Service who are drawing pay scales as recommended by the First National Judicial Pay Commission and subsequent revisions. To examine as to what extent the existing Dearness Allowance may be merged In pay and, to evolve consequent new set or pay scales merging DA there in and to suggest the mode of fixation of pay in the Revised Pay Scales. (a) Review the benefit of rent free accommodation allowed to various categories, necessity and justification to continue the benefit in the present scenario and if so which categories. (b) Review the benefit of additional HRA to the employees working In Scheduled Areas and Projects. taking into consideration urbanization, district bifurcation, improvement in transport facilities and availability of amenities. identification and classification on at the Scheduled Areas and Projects for which such benefit is necessary. To examine and review the existing Pension structure (or Pensioners. and make recommendations which may be desirable and feasible. Review of the existing human resource of all Departments in tune with the contemporary requirement including contract/outsourcing personnel. 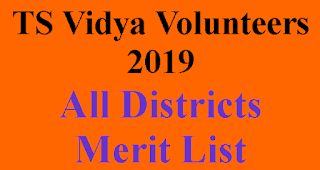 Review the necessity to continue Gazetted status to various posts and suggest any alternative methods; if Gazetted status is to he continued suggest the modalities/guidelines to accord Gazetted status to the Non Gazetted posts. having regard to the relevant recommendations of the earlier PRCs in the matter. Review the need for continuing various loans and advances to the state Government employees In the light of the orders of GOI as per the recommendations of 7th CPC and also In the present scenario of easy Availability housing loans and consumer loans from the Financial institutions. 2. While making their recommendations. the Pay Revision Commission shall take Into account the economic conditions In the State, the prevailing pay structure in Central and other state Governments, the resources available to the State Government, the financial Implications of their recommendations, both short term and long term and the overall impact on the State finances. 3. The Pay Revision commission will lay down their own procedure for receiving representations, examining witnesses and calling for Information. The Departments of Secretariat and Heads of Departments shall furnish all necessary information as and when required by the Pay Revision Commission and extend such co-operation and assistance as may be required by them. 5. The terms and conditions of appointment of the Chairman and Members of the Pay Revision Commissions on Will be issued separately. 5. The Pay Revision Commission will ordinarily function from Hyderabad, but may tour within or outside the State. If necessary.